Acorn Hill Academy: Great SALE from Homeschool Adventure Co.! 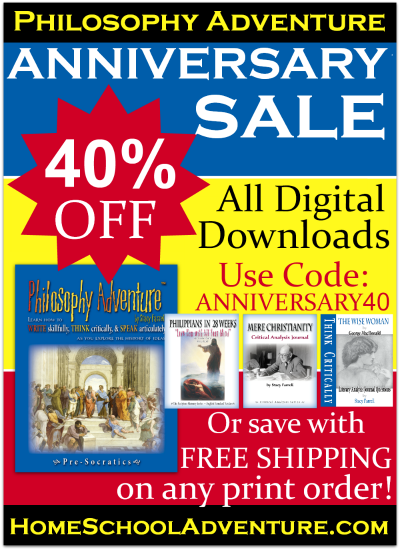 Homeschool Adventure Co. is offering 40% off their digital products, starting today, through June 30. All you need is the code ANNIVERSARY40 at checkout. If you prefer printed products, they're offering free shipping (no code necessary). We recently reviewed the Mere Christianity Critical Analysis Journal, and loved it. My girls read Mere Christianity with Ambleside Online's Year 7 this past school year, and they had a hard time with it. The journal helped focus their thoughts without telling them what to think. If you're considering any of Homeschool Adventure Company's products, now is a great time!